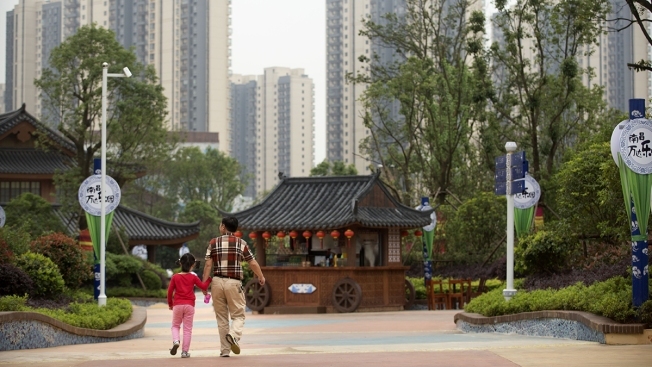 In this May 28, 2016, file photo, visitors walk through the Pottery Village section of the Nanchang Wanda Park theme park at the Wanda Cultural Tourism City in Nanchang in southeastern China's Jiangxi province. China is set to overtake France as the world's number one tourist destination by 2030 as a growing middle class in Asia looks to spend more on travel, according to experts at market research group Euromonitor International. By 2030, international arrivals are expected to have risen by another billion, corresponding to around $2.6 trillion in receipts. China is expected to have overtaken France by then to become the world's number one destination. Euromonitor's senior travel analyst, Wouter Geerts, said the gradual process of loosening visa restrictions has made traveling in the region easier, with 80 percent of arrivals in Asia originating from the region. He also said sporting events will likely further boost the region, with Tokyo hosting the 2020 Summer Olympic Games and Beijing the 2022 winter event. "Tourism is a key pillar of the Chinese economy, and much investment has been made to improve infrastructure and standards, in addition to tourism-friendly policies and initiatives," he said. Egypt, in particular, appears to be doing well, following a long period of decline largely linked to the political upheaval since a popular uprising in 2011 and the downing of a Russian passenger plane over Egypt's Sinai peninsula in 2015 by an affiliate of the Islamic State group, killing 224 people. Though Egypt's bookings were up 134 percent in 2017-18 from the year before, according to Euromonitor, the industry is still short of where it was in 2010. Egyptian government figures show 8 million tourists visited the country last year, way down on the 14 million recorded in 2010. One source of uncertainty for the outlook centers on Brexit. A 'no-deal' Brexit, which would see Britain crashing out of the European Union in March, would see millions opt to stay at home — an estimated 5 million in 2022 — rather than book overseas holidays, the report says. That would have a ripple effect across many destinations, notably in Spain, where U.K. travelers account for around a fifth of the tourist-related revenues. Euromonitor also warned that the U.S. tourism industry could face a hit if the trade tensions between the U.S. and China escalated.